Revelstoke Bear Aware has some active management initiatives available for residents of Revelstoke to make securing attractants easier then ever. This year the Gleaning Project has been expanded to include an online site – www.revelstokefruitshare.org. If you need help picking your fruit, register your tree at this website and anyone interested in picking your fruit can view and contact you to do so. Or register as a volunteer through Bear Aware’s Gleaning Project and be notified when fruit is available. Revelstoke Bear Aware has partnered with the Community Connections Food Bank and Food Recovery program to ensure that all fruit is used in a positive manner. All inedible fruit will be donated to pig farmers making this a zero-waste project. All portions of the Gleaning Project are free to residents. Revelstoke Bear Aware has some great workshops coming up to help education this month to help residents manage their attractants. A pruning workshop will be held April 17th with Loki Tree Services. A pruned tree yields better fruit, makes picking far easier, and increases the chances that the fruit will be used. An Electric Fence workshop will be held May 2 with Gillian Sanders of the Grizzly Bear Coexistence Solution. This workshop shows you how easy it is to install a temporary or permanent electric fence to keep bears away from bee hives, chicken coops, fruit trees or anything else. Call 250-837-8624 for details. Open and available garbage has been spotted throughout the city. If you spot any garbage or other wildlife attractants, the City of Revelstoke has a great reporting app called See Click Fix, http://revelstoke.ca/332/See-Click-Fix. A City Bylaw Officer will speak to the home owners. The wildlife attractant and garbage bylaw requires all residents to secure their garbage. Ideally this would be indoors or inside a garage or shed. For those without a secure place to store garbage. To report a bear attractant to the City Bylaw Officers, contact 250-837-2911 during office hours or email to bylawenforcement@revelstoke.ca. 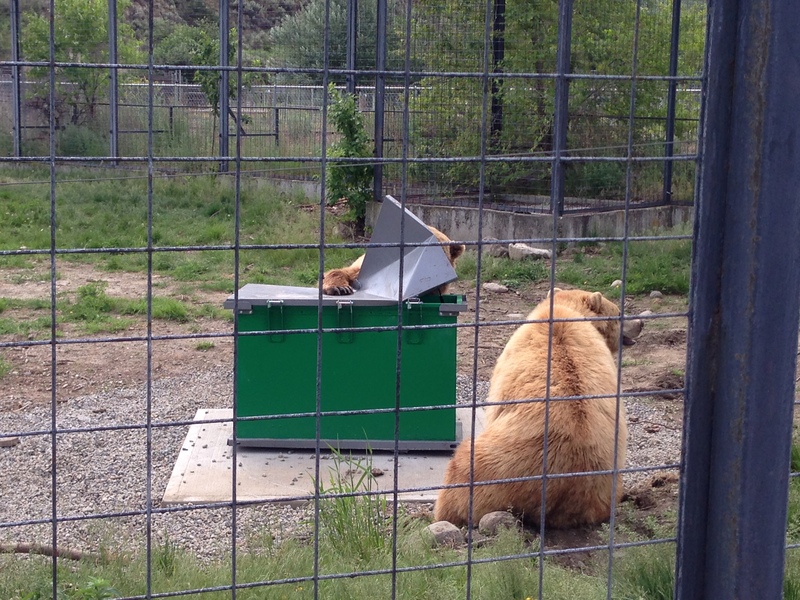 Secure garbage from bears, either in a bear- resistant container or indoors. Don’t put your garbage out before 6 a.m. on the day of collection. Remove bird feeders during bear season (April – November) or use only small amounts of feed and bring in each night. Consider a properly installed and maintained electric fence to protect small livestock (such as chickens and beehives), fruit trees, and compost piles. Do not put cooked food, meat, fish or cheese in compost. Keep compost piles working properly. Smelly compost attracts bears.